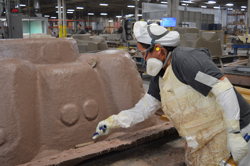 A Fiberglass Roller is responsible for smoothing out the fiberglass sprayed on the shell. They ensure that the fiberglass is not too thick or too thin. Position requires standing for long periods of time and prolonged use of arm. Tuesday thru Friday 6:30 a.m. – 5:00 p.m., some overtime required.